Harmony Engine EVO features four high-quality, formant-corrected harmony voices with independent vocal character, vibrato, and pan settings, and five channels of our unique CHOIR Vocal Multiplier , to let you turn each harmony voice into 2, 4, or 8 individual unison voices. Our Throat Modeling technology that lets you process each harmony voice through a physical model of the human vocal tract, and individual humanizing functions provide selectable amounts of variation to each voice for realistic, natural sounding results. Harmony Engine EVO provides all the tools you need to produce lush and convincing harmonies, whether you're looking to meticulously craft your own vocal arrangement note-by-note, perform your harmonies in real time with your MIDI controller, toggle between your own Harmony Presets , or simply choose chords or scales used in your arrangement and let Harmony Engine do the rest. 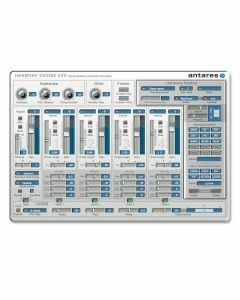 Antares' groundbreaking Evo Voice Processing Technology for faster, more accurate pitch detection and smoother, artifact-free pitch shifting. Harmony Engine EVO requires an iLok (not included). Windows 7 to 10 as required by your version of Pro Tools.